A matte painting is a backdrop that filmmakers use when the scene they need doesn’t or can’t exist in real life. In the past, they were created by actually painting a scene on a canvas. Today, they are created digitally by combining photographs to produce the scene that they need. 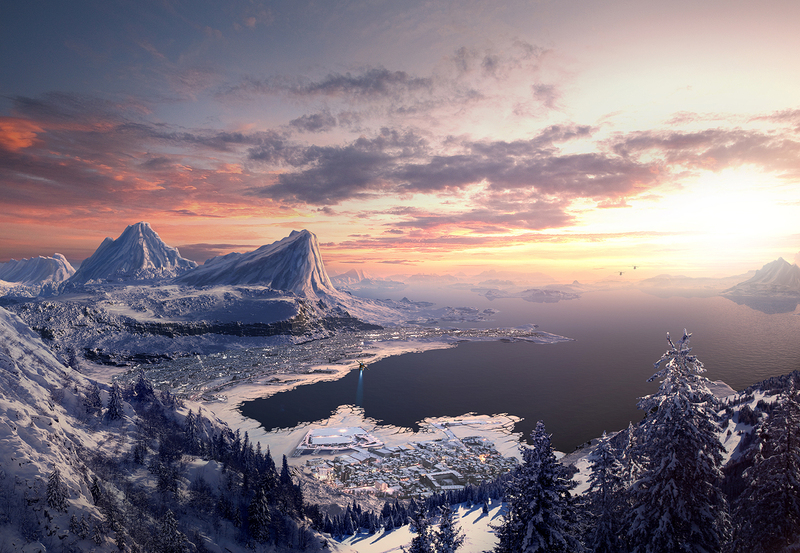 In this premium tutorial, we will demonstrate how to create a snow-covered, coastal, mountain town scene using Photoshop. Let’s get started! Before we begin be sure to download all the images and files to a project folder so you can easily access what we will be working on. OK let's open up this image (Base Plate1) I made for us to use as a base plate, almost all matte painting its made over a base plate which in case of a movie studio it’s provided by the production from the location where the film its being made and also all images used for the final image are provided or accessed through hi quality stock. In our case and for the purposes of the tutorial we have to find our materials on the free stock offerings so you can use them without issues, yet if you are able to go around the world taking photos, its a very good idea to build up your library, or buy a subscription to hi quality stock so you have a good choice of images available, finding the correct images that fit your project its hard work and takes quite a bit of time. I have made the selection for you and you can find all the images in the links above for your convenience. OK now open this render I made and flip it horizontal so we get the sun on the right; that is simply the choice I made for this composition. Now we will replace the sky with this lovely image, but first we must also flip it horizontally. Next we will use the distort command to make the horizons match. Once we have it in position let's use a big soft brush to mask off what we don't need. You can see in the resulting mask we have eliminated everything but the sky, be sure you have completely blocked with black what we don't need. In places where its needed make a quick selection of the sky in the base plate so you can precisely mask off the contours of these mountains. Then detail the mask even further so we don't have the greenish blue coming from the base plate sky. OK we have masked the sky in detail because there is no need to change it, we will be keeping the sky all the way through this image, yet the rest of the stock we will just roughly mask it into place until we are happy with the composition and the way the it fits. This is the way I do it because there is no sense in spending hours of detailed masking through tiny detail and then find out the stock does not fit or does not satisfy our needs. OK let's open up the next image, and also flip it horizontally so we can use it on the lower left corner of the image. Now for all this "rough" masking we will be using the brush shown here which is great for this and with a few modifications also good for much more. For now select it as it is and start masking off what we don't need from this image as shown below. Now just make sure we have it in a position that works, yet don't worry that is why we work this with masks, we can always go back and alter or fix whatever we need. Also for these rough layers we will assign clipped adjustment layers, so we can match the overall hue, saturation and contrast to our base plate. First let's do a levels layer with the settings more or less as shown, I say more or less because that is why we also have adjustment layers we can always and will go back and fine tune all through this process. And now we will add a color balance layer so we can match the hue of our base plate. We will be using these two layers plus others in all the stock we add to the image. Now here is what we have so far, we have our tones roughly matched to the overall image. Next up I decided to mask off even a bit more of this image and move it a bit further down and to the left. This is where I decided to place this image but feel free to place it wherever you feel looks best. Now let's go ahead to the nest image that we will use on the right side of the composition, copy it and paste it in a new layer. And let's repeat the same steps, position it where you think will be a good place and start masking off what we don't need included in our work. Then we copy both adjustment layers from the other image and clip those to this new one, modifying the settings of each to fit this new image. Now for the bottom central part I decided to use another image since what we have so far didn't worked well to my eye. And once again we go through the same steps, copy and paste it to a new layer, position it and mask off what we don't need. Here you can see from the masking I am making what part of the image I want to cover with this. I tried to indicate below which line of trees I choose for the mask limit and how both the previous left and right images merge on top this central portion. Now I included in this tutorial most of the mishaps that occur when working in such project so you can learn from them. In this case this image has a slightly different shadow "drop" than what we are getting from our base plate, you can see the green arrow its the plate light direction yet you can se the red arrows are where we have this image shadows dropping; so let's fix this. We just grab our brush with the settings below with pen pressure enabled and sample from the current snow first to remove all the existing shadows. OK once we have eliminated all the shadows we then sample from the existent shadows and paint new ones in the correct direction; note that we will detail these later, we want this process to be fast so we can come to a composition easily. When we are finished with fixing the shadows, we will now copy the two adjustment layers from the previous image and clip those duplicates to this one making some adjustments to match it to the rest. Here I included both layers adjustments for this image so you can compare to your results. Next up let's open this other image and paste it to our document. And the same way we did before we will re size move and mask off this new image to make it fit with the rest. Then we will make another copy of the adjustment layers and clip those to this one. You can see here how I go about modifying the mask until I arrive to a position that fits the rest of the landscape. Here is the result so far, I was required to add another adjustment layer to this new image, plus I applied some masking to these adjustment layers, to distribute the influence according to the depth and position. Now we will open this new image here and repeat the same basic process, copy and paste it position it and mask it off. In this case I lowered the opacity just a bit so it was easier to position it around the bay. So it was clear I needed to alter the perspective a bit so I used the distort command in this case. All the sky portion of this image was not needed at all so we can safely select that and delete it. Now we again mask off what we don't need and position it so it fits nicely around the bay. At this point I decided to work on the top and bottom of the bay separately, so let's make a copy of this layer. For one of the layers I masked off all of the upper bay section so we ended up with only the bottom part which we can individually adjust the perspective and later on the adjustment layers for each. Now after fixing the perspective a bit because of the extreme wide angle lens used for taking this image, then I decided to eliminate a bit of the right side as shown here. And then fine-tune the mask and position it where we need. Perfect, now let's enable the lower section of the bay, and mask off the other side, plus fine tune what we have around the bay. Now for each of these layers we will add a clipped levels adjustment layer so we can adjust the light for each section of the bay. At this point I decided to add some texture to the water in the image so let's open this water image and just copy and paste the selected portion. Now let's setup the layer to "soft light" and position it so it covers most of the bay. Now we will go all over masking off the texture where we don't need it all over the waters edge. Now at some point we will have a visible edge of our stock image so we will grab the clone tool to fix it. Here are the sections where I selected the clone source and where I applied to cover all of the water surface. Here is the overall cover of the applied texture, and we are finished with the rough masking and setting up of all the stock images we will be using. OK so here is the workflow I follow for this, first let's mask on again the edges so we know exactly where all the tree branches are; I created a layer below and filled up with blue so it is easier to see everything. Once you have all the borders back on its time to select a very small brush and mask off around each tiny detail until we cover all the layers edge. Don't forget to clean up everything that its not masked, with the blue layer its easy to see out of place bits that where left after the rough masking. Here is another example of the same process for the next image in the center, we can first see all the "rough" masking followed by masking in the edge so we can see and decide exactly where to create the edge. And once again, we go back in to shape the border of this layer and detail every little branch. OK so this is what this layer ended up like all masked and ready to be used, you have to do this mask detailing in all of the stock we introduced to our image and be sure all the layers are cleaned up. You can see this process clearly watching the included video. OK first of all the changes, at this time I decided to make a new render for the base, just changing the snow a bit, much more white and also added procedural texture to the ocean; I included both renders if you decide to use one or the other its OK. Also I decided to eliminate the back mountain, and instead of that piece of stock that never fitted well to my eye, we will be painting in those back mountains. Again you might want to stick with the stock or follow me into painting some sweet details for our image. These changes are included or left as part of the tut on purpose, it is part of the workflow, it is why we use rough masks to begin with; changes adjustments and decisions are part of the real workflow. OK so here we are we will be painting mountains on this section of our image just where the stock was placed. Next let's grab this brush from Photoshop, we will be using this brush all through the painting, we already have been using it for the masking, we will just change some settings in some cases, for now just as it is and sampling color from the plate we will start blocking shapes for our mountains. So sample a shadow color from around where the mountain will be and create a shape. By sampling from the base plate we have different shades for different layers of mountains, below its what I have so far. If you don't like some of the shapes just erase it off as shown, until you are satisfied with the contour. Then we pick some other darker shade to show the transition from the fully lit to the shadowy area. Now to start painting in detail we will be varying the size of our brush as we go into detail the size will be decreased to almost a dot, but for this we need more creative interesting settings in the brush palette so enable shape dynamics and transfer, both with "pen pressure" enabled. This will tie every stroke to our hand, and how we move it, how much pressure we apply etc. each stroke will be unique. OK so let's reduce the size of the brush a bit and start painting some more detail sampling color from what we have, and hinting areas of exposed rock or deep cracks; the trick here is to appreciate the base plate and knowing that the sun affects the right side of the rocks, the sky affects the top, and even the rest of the landscape affects our side of the mountain. OK let's go on to the next mountain and also add detail. Here is a sequence of what we are going through, sampling from the base plate, adding some rough shapes, sampling again, and adding finer detail; its a build up technique. And finally you can see I also extended the snow and mountain side to merge it well with the base. You can watch all this process and get a feel of it in the video. Let's change it up a bit before continuing with our mountains; let's paint some kind of ice crust breaking apart in our bay, so in the same way we have been painting we sample from the adjacent colors and start by blocking this section of sea that was left behind the city stock, and close that section up as shown. Now in the same at let's block in the rough shape of what we want around the bay. Then we sample a darker color and paint some rough cracks and features in the ice. OK here below you can see the rough sketch of what I have come up with, the overall look and feel of what we want. OK before continuing painting some more detail in the ice let me introduce another change I made. I like my new base plate water texture shown here, but I wanted some of the lightness of the previous render; so sure enough I assigned a mask on the new render to let some of that previous base shine through. So for this mask we will be using a big soft brush with reduced opacity as shown here. Easy enough you can see I softly masked off so the layer below shows through and combines with the new one for a nice looking sea. OK back to the ice, this is where we left our rough sketch of the ice cover; and you can see in red below what I mean about rough if you zoom in to take a look. So now let's reduce our brush, sample from the colors we have and refine all those sketchy cracks and features in the ice. OK this is what I ended up with for the ice cover, very straightforward process but again to get the feel for painting, and if you have any doubts you can access the video to see the full recording in HD of this step. Now let's get back to our mountains; it’s time to paint some finer detail on them, so let's reduce the size of the same brush with the same palette settings as before. 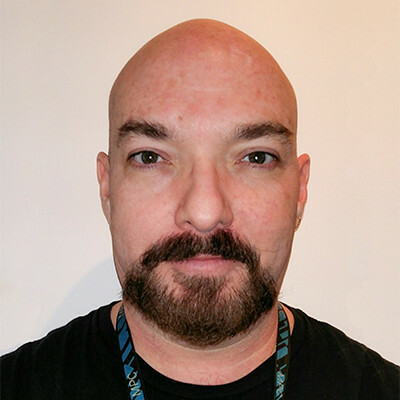 In this step I fluctuate between the 6px size and 2 px size. OK so the process its the same sampling color from the plate or from what we have already and following the features created from the previous painting we will just refine and make each stroke more defined, the build up of all this brushing makes our mountains come alive as they get the appearance more and more of being part of the landscape. We move on to the next mountain and do the same, you can see in these couple of images clearly how we just go around refining and enhancing what we already have. Finally we go on to work on the last mountain to the left and do exactly the same, refining our previous strokes to the next level of detail. Of course as with all painted steps you will benefit greatly from watching the video for this step. This step its small but we will use it as a recap of what we have painted so far, in the section below we will be painting a mountain with the same steps we have used until now to paint our mountains. So let's grab our familiar brush, about this size and to begin with let's disable transfer in the brush palette. Now let's sample color from the base plate shadows and block the general shape of our mountains; add or erase where you need, also notice that the mountains further to the back have a lighter different shade since they are further away and are more affected by atmospheric haze. Once we have the shape defined we lock the pixels in the layer. Then we start adding some rough features, again sampling from what we have for color. And then reducing the size of the brush to go in and paint detail on our mountains. As you can see it is in fact a recap of what we have been doing, you might want to paint in some more mountains, or different ones, yet with this process and this single brush you can paint almost whatever you want in a landscape. OK first off for this step we will introduce our first adjustment layer for the overall piece; here is what I have so far, but I want some more warmth coming from the sunset to contrast with the cold scene, so let's do this. Let's create a new color balance layer on top of everything and adjust it as shown, only for the highlights. This is the result our layer gives us but we need to mask it off some sections where we do not want its overall influence. So let's grab our big soft brush, of course varying the size where needed and mask off the shadow sections shown below; all shadows are cooler color than the illuminated parts so go about all shadow areas and mask of the effect of this layer. Now with the influence of this layer and any other layer we might introduce, some of our previous sections might need some adjustments like the lower section of the bay city shown here. So let's find this layer and first select the levels layer clipped to it and adjust it a bit as seen here; then, we will add to it a color balance layer, also clipped to this layer so we can individually adjust the coloring and have full control. So adjust the settings as shown, yet of course your eye is your best tool here so adjust as you see fit. Now with the adjustments you can see how we brought our layer back in sync with the rest of the image. OK moving on now with a new layer we will paint some details on our landscape, so let's make our brush very small, we will be using 2px and even 1px for this where needed, now let's sample some white from the snow on the sunlit area of the trees as shown below. Simply enough as you see in these two images we will add some snow highlights to our tree branches all over our image, taking into consideration where the sunlight comes from. Now in the image we used to the right we also have a shadow direction problem that we need to fix, the shadows in these trees are extending to much to the left and we need to fix the angle of those. So as we did before let's sample color from the adjacent snow and first remove the current shadows as shown here. Now sample color from the shadows close by and let's paint in some new ones in the correct angle for our image. Once we are done with this we will use the dodge/burn tool to darken some parts of this same stock, with a soft brush and of course varying the size as needed we will change the apparent shadow direction. In the next two images you can see where and how this will affect our image, plus you can see in the video the full progress for this step. So here we are so far our image its looking sweet, take your time in each step and detail everything to your liking, don't be afraid to go further than this tutorial which its planned with steps that you can apply in your own images and come up with brilliant ideas. OK we are on to the final steps in our image, we will be adding some adjustment layers for color saturation and contrast; and again masking creatively where we want these adjustments to be applied. Let's start with a hue saturation layer, and adjust the saturation as shown. This layer is to reduce the saturation in the lower section as shown here, but not overall. So let's grab the big soft brush again and mask off this layer effect over all the top portion of our image as shown below. OK once we are done with this let's create now a levels adjustment layer and adjust the settings as shown here. This darkens the whole image just a bit so we need to mask it off where we still want brightness. So with our same soft brush we mask it off where indicated in red to allow the original brightness to go through. Now let's add a new simple layer and grab the gradient tool set it to circular gradient. Then select the gradient I have prepared for you or create your own version as shown. Now click and drag to apply the gradient from the sun position to the beginning of the mountain. Once you have done that set this layer mode to hard light so we get the effect as shown below. Now that is a pretty glow but I don't want it all over the image so let's mask it off as shown here. And finally we mask off this last layer as shown here where we don't need the darkening effect. These are all the layers I want for my image so I am satisfied with the look so far, yet you might like some more layers or effects you are familiar with, so go ahead and setup your own layers or let's just move on to the next step. OK finally let's add some final touch; in this step the goal its to learn how to add structural or vehicle elements in this case and make those part of the image, so let's grab this final stock image and select the white back which makes it really easy to cut out; and just delete it. Now we won't need this chopper in the selection so go ahead and delete that one too. The upper chopper go ahead and select it with the lasso tool and cut and paste it on to a new layer so we have each chopper separate. Now hide the second chopper and let's work on the other, first off let's scale it way down as shown. Now let's add a levels layer clipped to it so we can adjust the shading and contrast as shown below. Now let's also add a color balance layer to it so we can adjust the hue of our chopper. Now let's mask off this layers warm tone off the shadow areas with our soft small brush as shown below. Very nice now let's create a new simple layer so we can paint dome highlights in the chopper by sampling some clear color from the snow close to it. Very good next we will need another layer, which we will set up to hard light as shown here. And then we will grab the circular gradient tool with the setting I have prepared for you shown below. And drag a couple of small gradients that will make up some lights in our aircraft; then just grab all the layers for this chopper and move them into a position you like. Now let's grab the other chopper layer scale it way down, set it up about the horizon to the right and then duplicate the layer and merge them together as shown below. In this case we don't seem to need any adjustment layers for these two, yet you might think otherwise. Next up let's grab our gradient layer with our blue light gradient settings let's apply in a new layer set to hard light a gradient as shown below. Now let's use the distort command as shown here so we have a directional light coming from our chopper. And finally with a soft eraser brush let's just eliminate a bit from it as shown here.